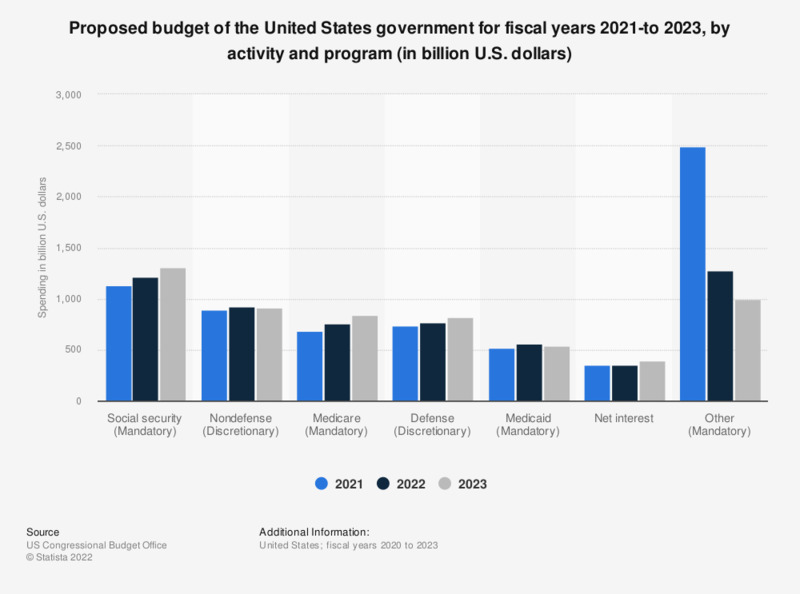 This graph shows the proposed budget of the U.S. government for discretionary and mandatory programs for fiscal years 2018, 2019 and 2020. In FY 2020, mandatory spending is predicted to sum up to about 2.89 trillion U.S. dollars. It consists primarily of benefit programs such as: social security, Medicare, Medicaid, as well as other* programs. Discretionary spending consists of spending controlled by lawmakers through annual appropriation acts. In FY 2020 it is proposed at 1.34 trillion U.S. dollars, and is divided into defense and nondefense* spending. Spending for net interest is also listed, which consists of the government's interest payments on debt held by the public, offset by interest income the government receives. * Other mandatory expenses are: unemployment compensation, federal civilian and military retirement, veterans' benefits, the earned income tax credit, food stamps, and other programs. * Nondefense programs are programs related to health, income security, education, veterans' benefits, transportation, and other activities. * Exchange subsidies includes the Basic Health Program offered under the Patient Protection and Affordable Care Act (ACA).